Barbara Dacey started with the station 32 years ago in 1985. She will retire after the New Year. In the small WMVY radio studio tucked away at the end of a long dirt road, three pictures hang on the wall — the Grateful Dead, Elvis, Carly Simon. It takes a calm voice and even calmer sensibilities to tie that disparate jangle of musical styles together. For 32 years, Barbara Dacey has been that voice. 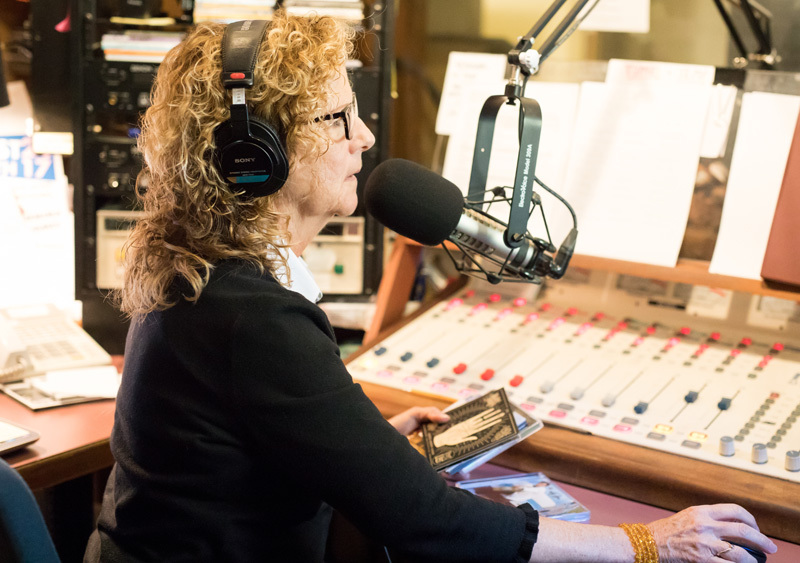 The WMVY radio host has announced she is stepping away from a career at the station that spanned 32 years, beginning as a volunteer commercial announcer and ending as director of world wide programming. She says it’s the right time to let other things happen in her life. It was a decision that evolved over time and took many forms, she said. Ms. Dacey made the announcement on the air during her midday shift on Oct. 24. Ms. Dacey’s career in radio began as a kid growing up in Wellesley, when she would race to the front seat of the car so she could control the radio buttons. But she didn’t get into the business until after a long stint living in Harvard Square, playing her guitar and singing professionally in coffee houses, bars and at festivals. She first visited Martha’s Vineyard in 1970, and fell hard for it. “The connection to the Vineyard, and the connection to the idea of the Vineyard and the idea of a place like this is very, very powerful,” she said. She joined the staff of WMVY as a part time announcer in 1985. 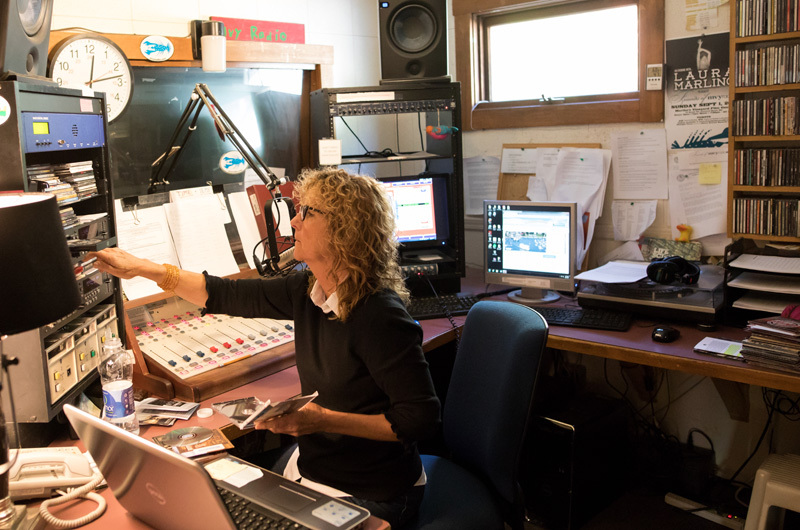 In 1993 she became program director, and in 2005 was named WMVY’s director of world wide programming, to focus on live streaming, interviews and station sponsored concerts. But being on the air was always her favorite part of the job, she said. In an interview with the Gazette, Ms. Dacey spoke a lot about choosing music to play. It was as natural to her as sliding up the potentiometer that turns on her microphone or pushing the button that plays the next cut of music. Yet she was reminded that many radio announcers do not get to have that conversation. Most have little say in the music they play. Ms. Dacey said that although Martha’s Vineyard is a small Island, there is a diverse audience with many different musical interests. She helped shepherd WMVY through a steady period of growth, not an easy task in a very small radio market with limited advertising potential. The station’s unique format grew organically, partly out of the Island vibe where it originated. Eventually it attracted industry recognition and accolades. The format even got a name: Triple A (adult album alternative). Ms. Dacey’s current title is no exaggeration. When the internet began to become popular, WMVY figured out how to get its programming out to the world. Now, more than half the listeners come from its internet stream, according to station manager PJ Finn. It ranks among the most listened to streams in the world. Little did the WMVY staff know how valuable a homegrown internet audience would become. In the fall of 2012, public radio powerhouse WBUR announced it had purchased the station, and planned to use the 92.7 FM frequency to repeat programming from its Boston studios to the Cape and Island’s audience. Just after the new year in 2013, an engineer in Boston flipped a switch, and WMVY was off the air. As soon as the news hit about WBUR’s purchase of their frequency, WMVY began a fund raising campaign. In just thee months, the station reached its goal of raising $600,000 in pledges. It was money enough to stay on the internet for a year, and figure out what to do next. In May of 2014, the station returned to the airwaves at the 88.7 FM frequency, as a completely reinvented business. The now public radio station had underwriters instead of advertising, and ran fund raising campaigns asking listeners for donations. Ms. Dacey was the first voice listeners heard, and she called the rebirth of WMVY one of the highlights of her career, a real triumph. Ms. Dacey will sign off from WMVY around the turn of the new year. She said she will miss the station, and hasn’t ruled out some future role in front of a microphone or behind the scenes. There is no substitute for the great MVY station and its sound. I have always enjoyed the great variety of artists and programs available on MVY (as someone coming to the island for 25+ years ). Good luck in the future Barbara ! We listen to MVY all the time. Great mix of music, easy to listen to on air personalities and a terrific format that really represents the island well. Barbara, congratulations on a terrific career and the best of luck in your future endeavors. The first thing that I do when I'm back on island is turn on WMVY; it really makes me feel at home when there, and streaming while off-island helps me to feel connected to the island when I'm on the wrong side of Vineyard Sound. We can't thank you enough Barara for sharing your wonderful taste in music and dedication to a cause in which you deeply believed. Hopefully others will carry your torch and perpetuate this amazing station in the same tradition. Best of luck in your next chapter. We will miss your smooth voice and musical knowledge. The absolute best radio station ever thanks to Barbara Dacey! The best of luck to her always. WMVY has been a huge part of my life, the memories now deep. MVY's Recipe for Success for Thirty Five Years? Stay True to the Music. Karen Altieri has been named the new director of development at radio station WMVY.